And in comic news: Rebecca Clements (author of KinokoFry) has a new webcomic: “Ruffle Hall.” Check it out! A nice mention of Spacetrawler over at Fleen. Thanks, Gary! 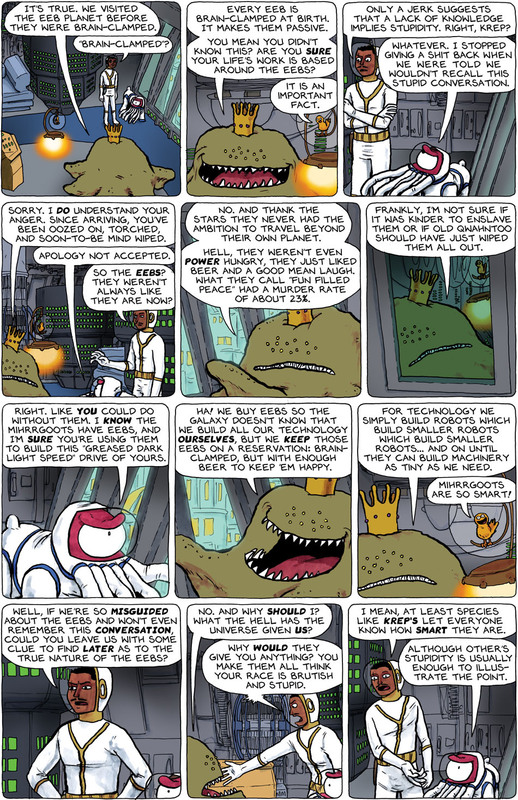 Also, kind words from Tristan over at Somninaut, and a very flattering paragraph about Spacetrawler (about 2/3 through the blog) which I missed back in May from John Allie (author of Sunrise). Typo alert! Second-to-last panel, Pierrot’s ranting should say “your race”, not “you’re race”. and aren’t they kinda like a species rather than a race? Good point. Freeing slaves can be dangerous. Okay Krep and Pierrot are in great form in this strip! Even when he’s being totally serious Pierrot made me laugh twice! Between them and the King’s love bird (Just imagine every line delivered in a falsetto), that was a total of 6 laughs out loud! And panel 9? That is the funniest, most irreverent description of nanotechnology I’ve yet read! I may ask your permission to clip that panel at some point, not yet but I’ll let you know. What absolutely makes my day is the happy camper look on Oohlooh in panel nine! Kudos to Chris for that! I should have bought early-bird tix. I have other stuff going on that means I just couldn’t swing the price. I’ll be with you in spirit. Do you ever sign books that you sell online? I was gonna go all geek fangirl too. Which probably means I’d go mute and wouldn’t say anything anyway… so maybe it doesn’t make a difference if I’m not there… haha. If you see anyone from The Source – they’re the best comic/gaming shop in town. I hope you get good response from everyone here. Prairie, I do sign books any shirts or books people buy OR bring. And I happily do doodles and even sing. Dancing is contingent on my mood. Them unclamped Eebs must have been REAL good at building little Eebs! I thought we South African’s are the worst killers. Well, maybe not much if their population is in thousands of billions.